The main Cizhou kiln 磁州窑 , located at Guantaizhen in Handan of North China's Hebei Province (at that time under the Cizhou Administration), was an important kiln in the Song Dynasty (960-1279), and a representative of the civil kilns. 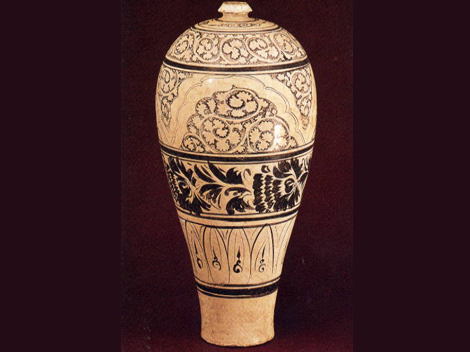 Cizhou porcelain was a type of ordinary household ware manufactured in the region of Cizhou, hence the ware's name. Archaeological investigations locate the Cizhou kilns over a large area -- far beyond the confines of Cizhou in the Song Dynasty. Production flourished most in southern Hebei Province and northern and central Henan Province (Central China), which included the areas of Handan, Pengcheng, Cixian, Yuxian, Xiuwu, Hebiji, Lushan, Baofeng, Dengfeng, Mixian, and Tangyin on the Central Plains. Shanxi (North China), Shaanxi (Northwest), and Shandong (East) provinces also produced this porcelain ware. Cizhou porcelain came in many glaze colors: white, black, yellow, brown, and green as well as a blended glaze. Cizhou's most outstanding achievement was applying the traditional Chinese art of painting to porcelain, with the painted decoration on white glaze being mostly black or brown, or black on green or yellow glaze. There were also incised, engraved, carved, and embossed designs on white glaze, all showing proficient skills. Cizhou motifs were fish, aquatic weeds, flowers, birds, galloping deer, frolicking rabbits, dragons, phoenixes, vases with carved designs of flowers on a body with pearl-like dots, acrobats, legends, and poems and essays. 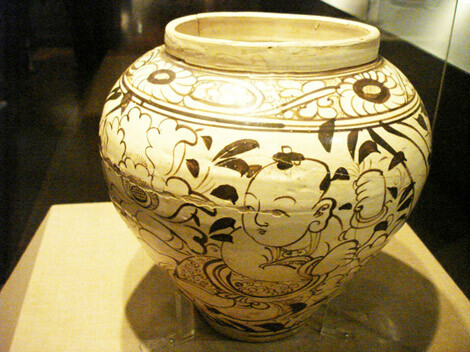 One example is a white-glazed jar with carved designs (Picture 2) . 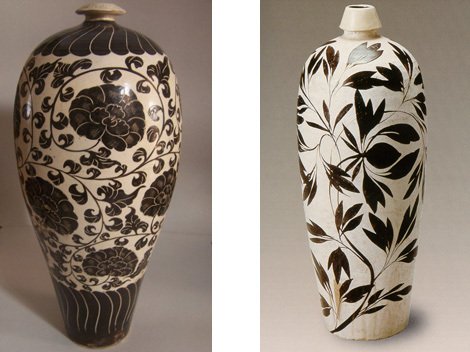 The paste surface is coated with refined white clay, while paintings of entwining peonies cover the jar body. When potters created this jar centuries ago, they removed the white clay from the jar, except for the flower designs, exposing the grayish brown paste. After finishing the product, potters covered the whole piece with a light vitreous (glasslike) glaze, the designs showing in relief. Originally, the flowers were pure white and vivid and the background was brown, presenting a strong contrast in color. The style of painting was bold and unrestrained, striving to capture the theme, while a few strokes brought the motif to life. A covered jar of white glaze with black designs, a vase of white glaze with a carved design of twin tigers, and a white-glazed headrest with a lion in black show strong color contrast and original composition. 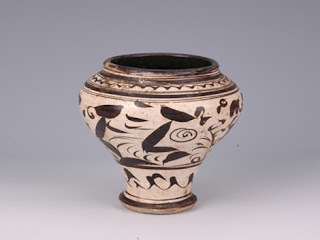 These and the masterpieces mentioned in the previous two paragraphs exemplify the historical decorative art of Cizhou ware.